Managing partner of Bloodworth Law, PLLC, Reed Bloodworth, is one of Orlando, Florida’s, top business and commercial litigation attorneys as noted by the 2019 U.S. News & World Report Best Lawyers in Commercial Litigation Award. Reed was named by peers as a 2017-18 Florida Trend’s Florida Legal Elite in Commercial Litigation placing him in an exclusive group of lawyers that includes less than 2% of state’s litigators. Known as one of Florida’s most respected trust litigation, and probate and estate litigation attorneys, Reed focuses on resolution of legal disputes for trustees, personal representatives, beneficiaries, trust companies, and non-parties. Bloodworth Law, PLLC, is committed to taking interesting business litigation, trust and probate litigation, and employment law cases across Florida. Travel to courts is made by members of the law firm to most cities and counties from Pensacola to Miami, Daytona to Tampa. Bloodworth Law offers multiple payment methods available to plaintiffs and defendants which vary by case acceptance. Fee options may include hourly fees, flat fees, hybrid fees, and some cases which are taken on contingency. Find out how to begin your case today. Talk with Reed about how Bloodworth Law can help you and your business. I often talk with people who want to file a lawsuit due to broken contracts, failure to provide services or products, or litigation as a beneficiary left out of a trust or an estate. First, I tell them that the filing of a lawsuit is predicated upon some wrong committed against you or your business. Reed Bloodworth accepts cases from plaintiffs and from defendants. Plaintiff clients are offered several payment methods to begin cases including: contingency fee, project fee, hourly fee, or a hybrid fee structure. Defendant clients are offered hourly fees or project fees to begin a case. Reed feels it’s important clients understand the various outcomes when litigation on an issue begins. While a client often wants to sue an opposing party–which can become expensive and lengthy–there may be alternatives better suited to reach client goals. Reed forms a team with clients to pursue the desired outcome on a case. When a business dispute incites legal action, or a problem or action arises involving a trust or an estate, learn your options. Reed invites you to ask questions and provides answers you’ll understand. Talk about your legal problems in a formal consultation by calling Reed at 407-777-8541 or send questions to attorney Reed Bloodworth at Reed@LawyerFightsForYou.com Work with a skilled attorney who you’re confident can and will help you in the area of law in which you’re having problems. What are the 3 Stages of a Lawsuit? Many people ask how a lawsuit “works” or progresses. I tell clients that the case varies and that no case can be compared to yours. Facts in every case vary so I thought I would answer the question: what are the 3 stages of a lawsuit? The Complaint is Filed: You have your pleadings stage which is where we file a complaint stating what the other party did wrong. We’re saying that someone did something wrong and that it caused physical harm or injury due the action taken by the other party. We file a complaint on behalf of you, the plaintiff, or defendant, in a formal complaint against the other party. It may be against a business, an individual, a corporation, or even a government entity, but we’re stating that their actions or inactions caused injury to you through their negligence. Defendant Response: The defendant will then have to file an answer in affirmative defenses. Now, sometimes, defendants file a Motion to Dismiss, in which case we have to go to a Hearing. Occasionally we have to file an Amended Complaint. If that occurs we will attempt to prevail on our motion to dismiss and the defendant will have to file an answer in affirmative defenses. When that is filed that is the end of stage one of a case and the end of the Pleadings Stage. Paper discovery, meaning we go and attempt to gather up all the available information pertaining to your case. Evidence and a lot of that evidence comes from a range of official sources, police records, contracts, paperwork signed by parties involved. Information provided in statements by witnesses, parties involved and we build a case. The other thing we do is we’ll serve written questions to the defendant. Those are known as interrogatories and we make them answer those questions. Those are usually more basic questions such as who was involved. The other standard discovery tool is a Deposition which I’m sure you’ve seen many times on TV. But what happens in a deposition? In a deposition, the attorney sits down with someone in the case, a witness in the case or a party in the case and asks a number of questions to lock in their testimony and get questions about the case answered. The deposition involves the plaintiff, or the defendant, and their legal representation. Both parties may be represented, but you are not necessarily going to be seeing the defendant or the plaintiff. You are more likely to see the opposition’s attorney. The opposing counsel is allowed to ask you questions about what happened in the incident. I will be at the deposition with you and I will prepare you for the deposition so that you understand what will happen. You will be asked questions and I will be there to raise objections should the opposing attorney become aggressive or ask questions that are not allowed. The reason we do this is we want to know exactly what they’re going to say if and when we go to trial. If they attempt to say something different in trial we can then cross them with their previous testimony. This is known as discovery. The opposing counsel has the right to find out what you will say in a court of law should the case go to trial. Stories must be exact and should not change. Sometimes a case will be settled out of court and resolved in an early Settlement. There is no way to know whether this will happen or what the amount will be. A settlement involves negotiation between the two parties outside a courtroom and is usually involving attorneys: a plaintiff’s attorney vs. the defendant’s attorney who is often representing a business, an individual or a corporation or insurance company. The Third Stage is the Trial Stage. In any case, if you don’t win a Summary Judgment the case will have to go to trial. A Summary Judgment is when all of the facts in a case are agreed to by both sides and the only issue left to decide is one of pure law. A summary judgment ends the case. I was named a 2019 U.S. News & World Report Best Lawyers in Commercial Litigation. 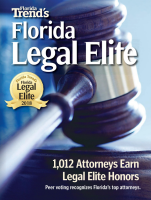 I was selected by my legal peers as a Florida Trend’s Florida Legal Elite in 2017 and 2018. I’m honored because this award is given to fewer than 2% of Florida attorneys. 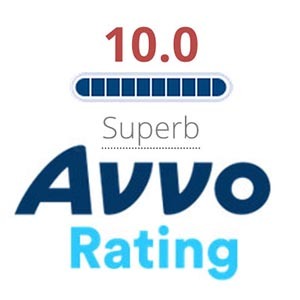 I’m an Avvo-rated 10.0 Superb Attorney in Business Litigation, and Trust and Estate Litigation. 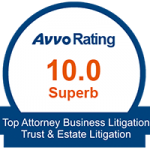 And I’ve been a Martindale-Hubbell AV Peer Rated Preeminent Attorney for the highest level of professional excellence since 2004. Contingency fee means that the client pays legal fees when the lawyer and case brings in money from the legal actions taken. Reed immediately begins work on the case to pursue a legal action that will yield financial results. Clients, meanwhile, are not billed, have to write a check, or pay by credit card to get a case moving. Every case is reviewed and there is no guarantee that it will qualify or be accepted as a contingency fee case, but you should find out through talking with Reed. Contingency fee cases are available for business litigation, for trust litigation, and estate litigation cases. Reed’s services include Florida Business Litigation, Trust Litigation, Probate Litigation and Estate Litigation, and Personal Injury Litigation.